Is reduced progressivity of taxes responsible for the rise in inequality in recent decades? Tax Progressivity and the Rise in Inequality, by Lane Kenworthy: Income inequality in the United States has increased sharply since the 1970s. How much of this is due to reduced tax progressivity? A key element of the rise in inequality has been the dramatic jump in incomes among the top 1% of the population. According to calculations from IRS data by Thomas Piketty and Emmanuel Saez (available here), this group’s share of total income more than doubled during the 1980s and 1990s. This is due in part to the fact that in recent decades taxes have done less to reduce the top 1%’s income share. The following chart shows the pretax and posttax income share of this group from 1960 to 2001, according to the Piketty-Saez calculations. 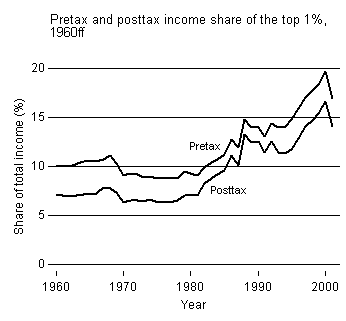 Between 1960 and 1979, its posttax income share was 70% of its pretax share. In the period from 1980 to 2001 that increased to 84%. What effect has this had on inequality? The chart makes clear that most of the rise in the top 1%’s posttax income share is due to the increase in its pretax share rather than to changes in tax progressivity. The next chart offers another way to see this. 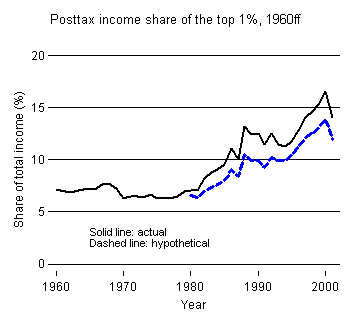 The solid line in the chart shows the top 1%’s share of after-tax income since 1960. The dashed line shows what the top 1%’s share of income would have been had taxes reduced it to the same degree as in the 1960s and 1970s. It’s lower, but not massively so. Changes in taxation have mattered, but they have not been the main reason for the rise in the top 1%’s income share. If reducing inequality is an aim of the next administration, increasing the progressivity of our tax system would surely help. But this is only one piece of the puzzle.